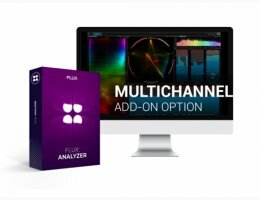 As a complement to the Pure Analyzer Essential, in addition to the Pure Analyzer Multichannel module, two other different add-on modules providing specific tools for their actual field of usage, are currently available. In order to use any of the add-on modules, the Pure Analyzer Essential is required. Unique spectrum over space scope, providing real-time visualization of the the audio content in the surround space-frequency domain. Pure Analyzer Essential is required in order to run Pure Analyzer Multichannel.